When Vincent Rose died in 1944 he was hardly a household name, but he had had a string of popular hits – “Linger A While”, “Avalon” and “Whispering “ amongst them – and had worked with the likes of Al Jolson and Count Basie: an unlikely destiny for a boy from Palermo, Sicily. A great loss, but then we’ll always have the songs, and at least he isn’t here to hear this version of “Blueberry Hill”. We give the bartender a wink and head out to the fireplace. It’s blessedly quiet as we warm ourselves at the hearth and I poke the embers to get a flame going. 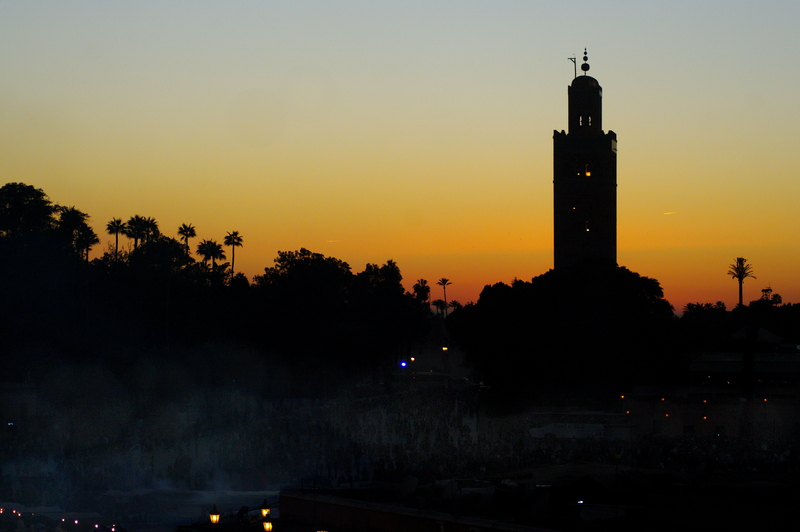 The silence is broken by the muezzin who calls out from the Koutoubia mosque, and is echoed by his colleagues from more distant minarets across the city. The Koutoubia minaret is one of three extant towers – the other two are in Rabat and Seville – built by the Almohads, a 12th century dynasty that ruled from here to southern Spain and across North Africa. Because of city planning and building regulations that keep the medina low-rise, it can be seen from afar in every direction. The spiritual and metaphorical heart of the city, the call from it travels a short distance to be heard in the courtyard of this hotel, where wealthy foreigners lounge or potter round the billiards table. It is heard in the mellah, the old neighbourhood sandwiched between the royal residence and the Bahia palace that was once a Jewish quarter. The houses are a little taller there and the streets a little narrower. One can only imagine the lines of communication that would have been established via the grilled windows of the upper floors. Today it is impoverished, devoid of the souk trinkets that inundate the medina, unsanitary and a world away. 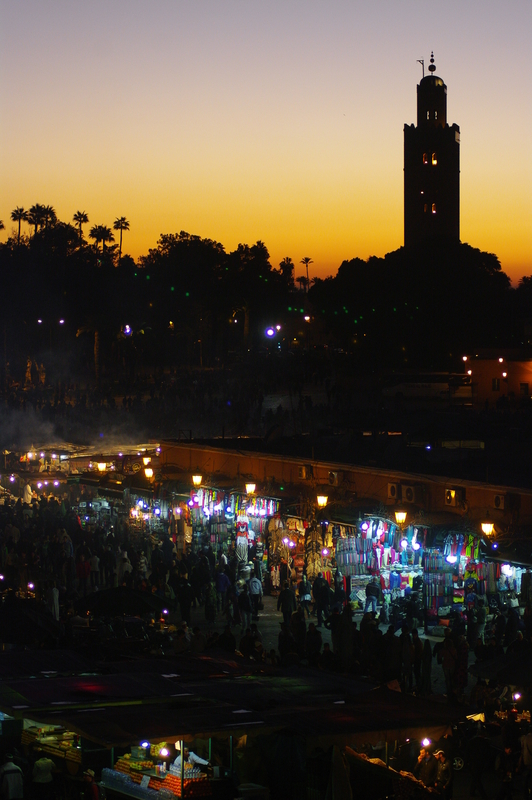 It can be seen and heard from a high terrace overlooking the Jemaa el Fna, sipping mint tea as we do on our last night. The city’s central square is a writhing mass of movement to the charmers’ flutes. The sun has set so the darkening overhead and the illumination of the square are inversely proportionate; as if light were a liquid, the sky slowly drains of it and the bulbs below on the square fill up like bottles. It can be seen and heard from down there in the melee, as we do every day, weaving and bobbing from food stall to fire grill, from hypnotic Berber band to henna artist, from trance-inducing Gnaoua music to gung-ho, self-appointed dentist, to pushy, predatory snake charmer. 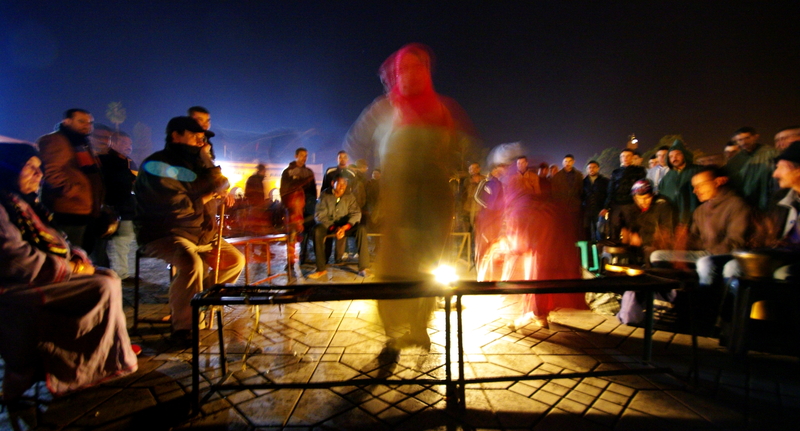 The square is worked all day in shifts – dentists in the afternoon, music in the evening – but is at its best when night falls and the reasoning behind its Unesco status becomes apparent. The scene presented might easily be dismissed as put on for the tourist, if it hadn’t been happening here for so many centuries, if the smoke from the barbecued meat weren’t mingling with the smell of the sewers, if the snake charmers weren’t competing with trained monkeys on chains and if the stories told weren’t told in Berber or Arab to a local audience – other Berbers up from the desert or city people out for the night. 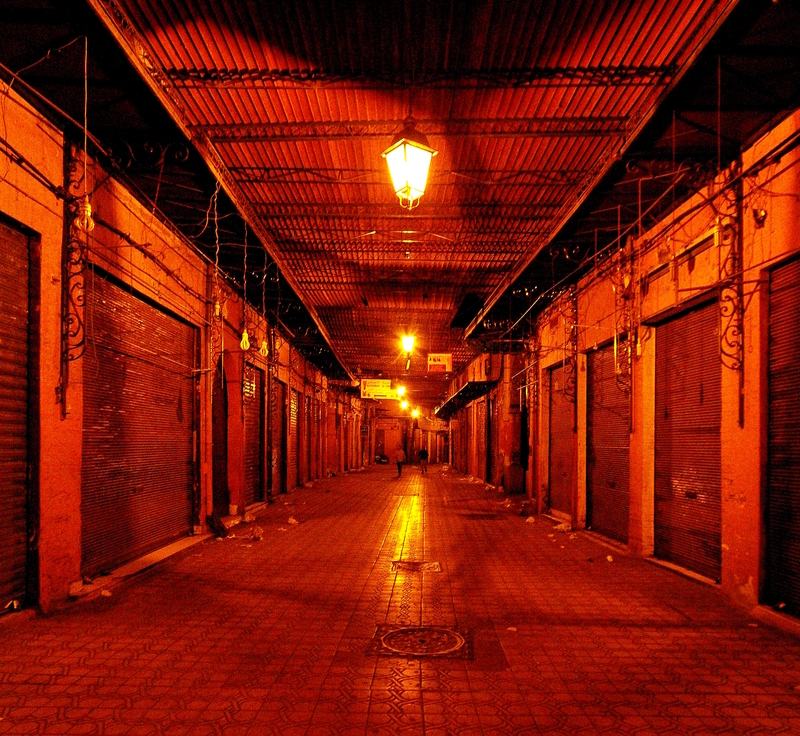 The Jemaa el Fna is as unnerving as it is alluring, never feeling fully safe and never wholly threatening. The methods and madnesses of the square seem to bleed out through the narrow arteries that snake off from it in every direction, the squeezing souks that pump the tourist round the medina in circular flows of sensory overload, spices and fabrics, silk and leather slippers, metalwork and carpentry and strange medicines for the believer in magic. 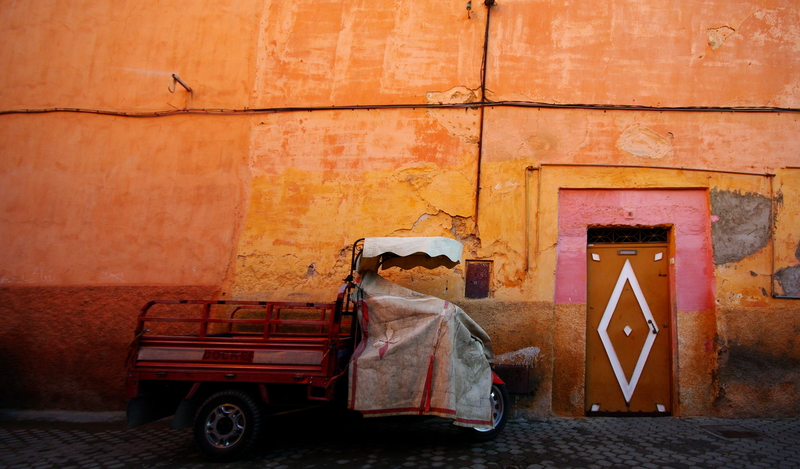 This is the Marrakech they come to see and you can see why it’s called the Red City. Although the colour is still in use for rendering buildings in the new town, nowhere is it as ubiquitous as here in the medina. At night, with the added tint of the streetlamps, the alleys turn from the sun-bleached pinks and blushing terracottas of the day to a deep, blood red. It looks like everything is crumbling beneath a layer of rust – as if time itself was oxidising the place, testing the city’s mettle. You’d have to wonder – looking at the shabby, fraying edges of absolutely everything – how long it can all last, but then it seems to have done alright so far: a messy but magnificent mix of high and low, rich and poor, emergent Africa and French colonialism, aversion and seduction. And at the centre of it all, the minaret. Seen peeping over the palms from the rooftop of a bar on the Place des Ferblantiers, the city around it seems positively sedate. I wish the Italian family that just sat down at the next table were as sedate. They chatter away loudly as the muezzin calls again. The Koutoubia guy sounds less martial than his colleague north of the square in the Ben Youssef mosque – there’s a tremulous vibrato to his voice as it rises through the musical scale that makes K giggle. We groaned inwardly as we came upstairs because there’s a keyboard set up down there and we’re expecting another gruesome musical experience once the callers of the city are done. Even the Italians, though, shut up when this guy gets going. He proceeds to blow us all away with a powerful, smoky, motown voice – the equal of any big name you might think of. The best I’ve ever heard live anyway. It’s a total shock and gets us excited again – we’d been fading a little after a long day. As we leave I pass him by and offer my own applause; he looks Moroccan but I wouldn’t be surprised if few of his countrymen – busy in the market streets of the Kasbah behind the old walls outside, buying and selling bananas, kitchen sinks, oranges, mobile phones and magic wooden masks – ever hear him sing.